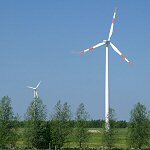 Renewable power has covered more than one third of the German gross electricity demand in the year 2018. Today wind power is the most important renewable power source, followed by biomass and photovoltaics. To keep the 1.5 degree climate protection limit the increase of the renewable power generation is still too low. Until beginning of the 1990s only one renewable energy source for electricity generation was relevant: hydro power. At the beginning of the twentieth century the hydroelectricity share of electricity generation was much more than 20 percent. Due to a significant rise of the electricity demand, this share has been reduced drastically although new hydro power stations have been built. After mid of the 1990s wind power has got a significant share of the electricity supply. In 2004 it produced more electricity than hydro power and is now clearly the number one. In 2007 electricity generation from biomass is on the second place before hydro power. The following tables and graphic show the renewable electricity generation since 1990.